The doctor says he is going to cut your loved one’s heart. You ask him if there’s a need to do so, how he is going to cut, whether there’s any risks and potential dangers, and if an independent assessment is going to be made. His reply is that he would tell you at an appropriate time. How would you feel? Naturally, you would be worried and want to know what’s happening and whether it’s the right thing to do. 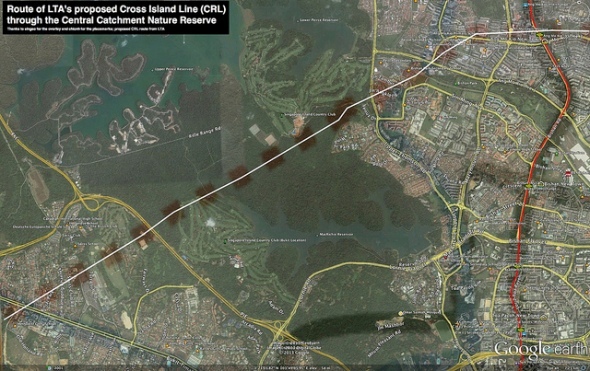 Similarly, the Land Transport Authority (LTA) has announced plans to build the Cross Island Line (CRL), a MRT line that would cut across the Central Catchment Nature Reserve (CCNR), which is known as Singapore’s Green Heart. Nature Society and concerned individuals are asking LTA on the environmental impacts of the line crossing the legally protected Nature Reserve, and if an Environmental Impact Assessment (EIA) would be conducted. LTA says it would conduct an EIA but did not mention when, and adds that it would engage Nature Society at an “appropriate time“. How would you feel? The appropriate time to engage is NOW. In fact, the most appropriate time for LTA to engage stakeholders is before the announcement of the plan for the CRL to cross CCNR. Unfortunately, LTA did not do so. As the CRL cuts through the CCNR, which is a sensitive habitat and legally protected Nature Reserve, it is important for LTA to be more proactive and transparent in communicating its actions on this issue. Interested groups should be engaged at this stage before any feasibility and EIA studies are conducted, so as to avoid unnecessary second-guessing and worrying about the impacts. NOW is the time for LTA to engage Nature Society and interested individuals and groups. Share your plans for the CRL and the EIA. Share, Explain, and Engage Now. Not at an appropriate time. You can send an email to LTA CEO, Mr Chew Hock Yong, at hock_yong_chew@lta.gov.sg and remind him politely that now is the appropriate time to engage stakeholders on the CRL, and ask him to set a date to engage the stakeholders before the feasibility and EIA studies are conducted. What we need is not an appropriate time, but an exact date and time.